If you only have 10 inches to spare in your bathroom for storage, you’ve hit the jackpot with Ikea’s Stolmen Rotating Mirrored Cabinet. The cabinet rotates easily to expose the mirror side or to gain access to your boudoir must-haves. When you live in tight quarters, maximizing vertical storage potential is critical. The cabinet measures 10″ wide x 39 1/2″ tall and sticks out from the wall about 10″. You’ll need a friend to help secure the cabinet onto heavy anchors in the wall but it is well worth the effort. Total cost: $75. I swapped out the blue shelf lining with marble contact paper left over from a previous project. It looks fresh and is easy to clean. Remember, it’s easiest to attach the contact paper before you assemble the shelves and cabinet. Small-space nesters know that Ikea offers so many solutions for cramped corners but to give them a custom look, you need to put a DIY stamp on it! Enjoy. Riding on a Use-What-You-Have challenge I set up for myself, an old picture frame (left over from a gallery wall of vintage frames) gets a new sense of purpose in my home. 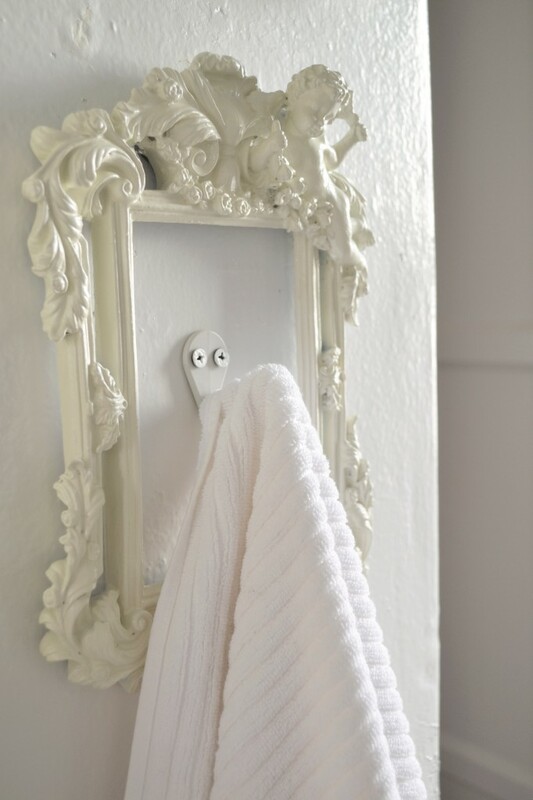 Instead of installing a plain towel hook on the wall, the guest towel hangs front and center in its own frame. The project took 5 minutes and $5 to complete. Love when that happens! 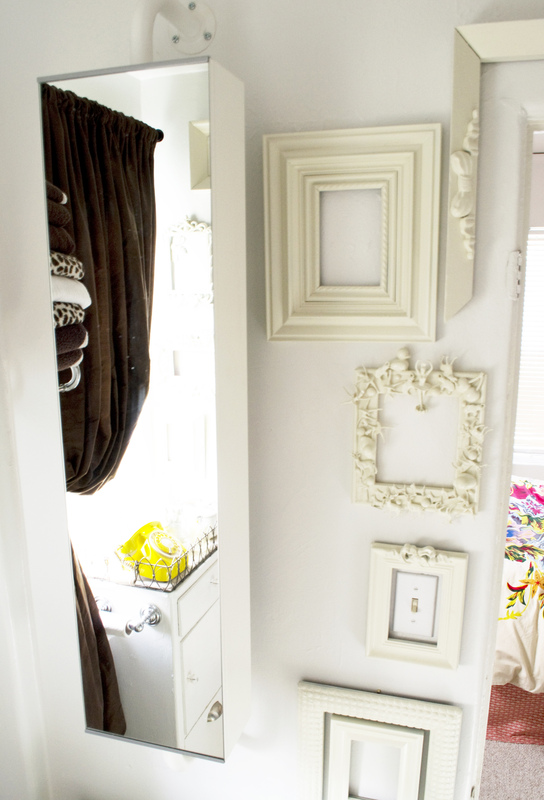 Choosing an off-white spray paint color instead of pure white gave the picture frame a warmer, more aged look. Off-white accents again a crisp white wall gives this small bathroom more depth and interest. Trying to live “large” in tiny digs means surrendering a size-ist attitude toward my space. I live, work and entertain in a petite floor plan as if it were a grand, well-appointed home. 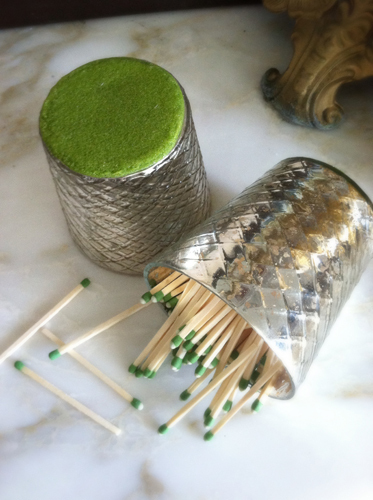 It’s all in the luxe details like this mercury glass match and strike holder you can make with very humble materials. I love giving these votives as gifts to my lucky friends with fireplaces, and I keep one on a coffee table next to my candles. The strike pad on the bottom of the glass is made from white glue and craft sand. That’s it! Could not be easier or cheaper. Use about a 1/2 cup of plain white glue from the dollar store mixed with 1/4 cup of colored decor sand available at online and at craft stores. These are approximate measurements. 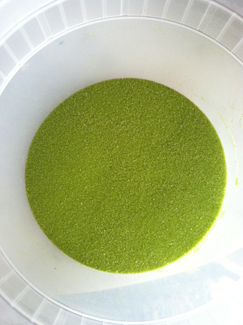 The mixture needs to be the same thickness as thick cake or pancake batter. As a test it should hold its shape when you drop it onto a piece of paper. Once you’ve got the right consistency, use a spoon to place a good dollop of glue-sand onto the bottom of the votive holder. 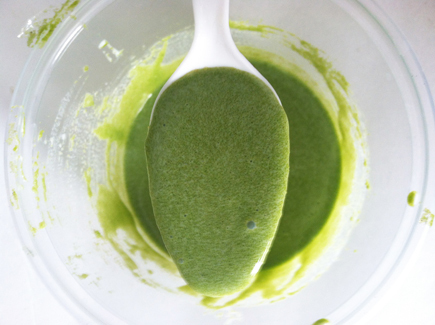 Spread it around with the back of a spoon so it covers the bottom evenly without dripping over the sides. The finished layer should be about 1/8” thick. It will take 24-48 hours to completely dry. 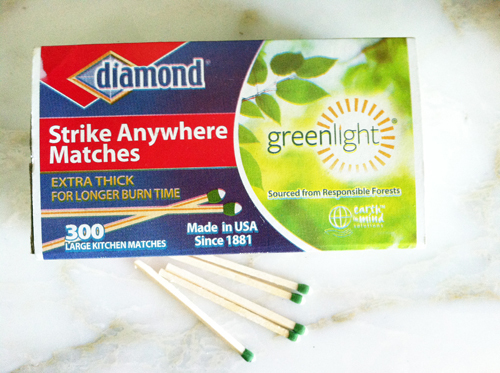 The trick is to use strike-anywhere matches that you can buy from places like Ace Hardware. Look for the ones with the green tip. The other kind of matches will only strike on the box and will not ignite on a sandy surface. 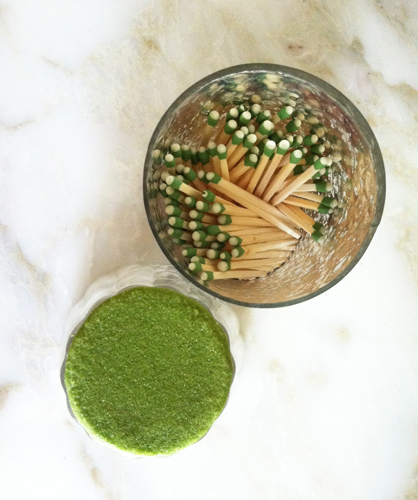 The green match tip is the reason I chose to use moss green sand. I like tying those two elements together. Remember, when you live in tight quarters, the small details speak volumes. A match and strike holder like this one is a petite accessory that will give your home a big style boost without taking up a lot of valuable real estate. Give it a whirl!! Do the math. 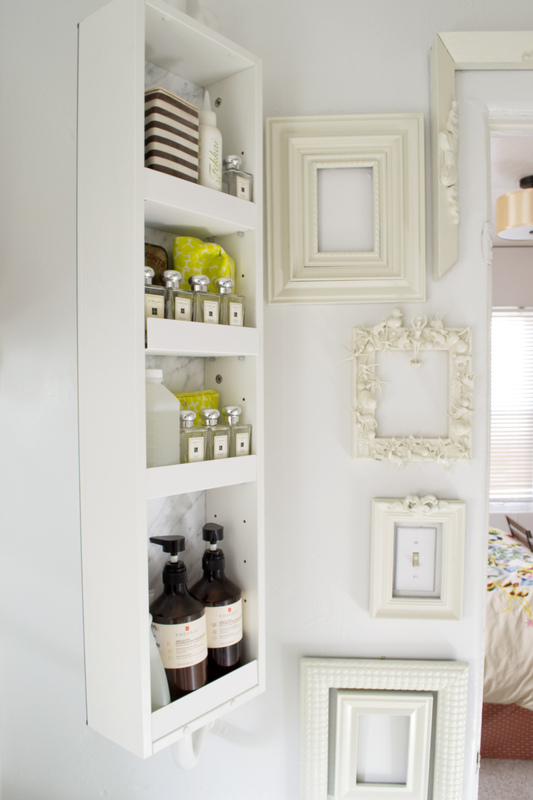 A small home plus a cramped foyer equals a desperate need for vertical storage. When there is very little floor space to work with, you have to look up. In my own personal search for storage solutions, three things I know for sure. One, they have to be easy to maintain. Two, they have to have unique style. Adding a polyurethane molding appliqué in orange to the top of frame makes me smile. Three, they have to be flexible and portable enough to take to the next abode. If it’s an ugly box or a generic coat rack, I won’t be motivated to use it in the long run. I don’t know about you, but I have to trick myself into staying organized. Repurpose inexpensive rubber boating straps stretched across the wall to become a vertical catchall space for keys, cameras, sunglasses even sneakers. Stretch and attach the straps horizontally to screws spaced apart equally. The rubber ball on one end is hollow and securely slips over and onto the head of a screw. The straps come in red, blue, yellow and white and are sold at boating supply stores around the country and better hardware stores. Try them in every room in the house, including the bathroom. 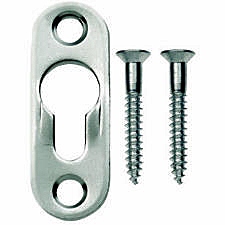 Use Wall-Dog™ drywall screws, which are screws and an anchor all in one. These screws leave small holes behind that are easy to patch when you to take the rubber straps on the road to the next house gig. 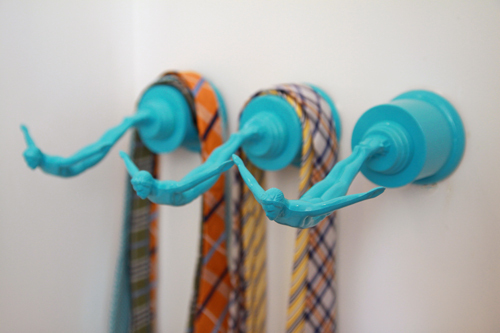 No need to deal with messy, wall-marring anchors. 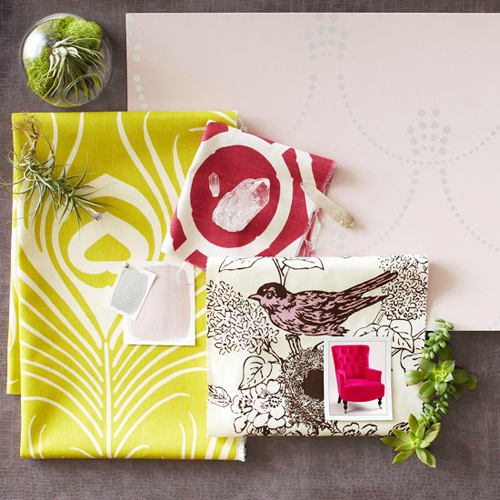 A few weeks ago Better Homes and Gardens asked me to suggest a fresh color palette and create a design board complete with accessories that would help make a room pop for spring. 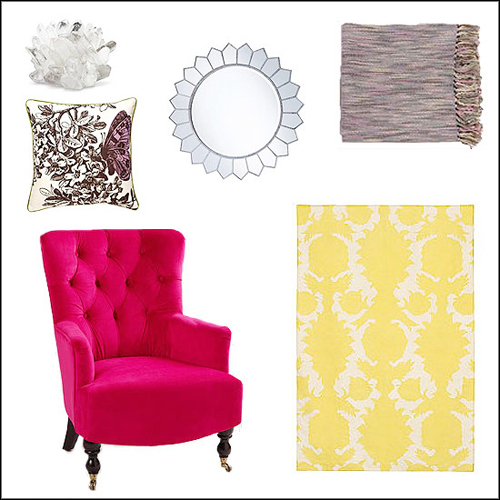 Citron yellow and a gray-pink were my inspiration. Check out the full list of resources and tips from bhg.com. This is a truly useful guide, but I never subscribe strictly to decorating rules. As you gain more confidence in your design sense, feel free to play around with these color ratios. If you are afraid of intense colors, try using a wall stencil, which lets you accent the wall with color without overwhelming the room. My slowly growing vintage trophy collection made me look at these inexpensive plastic diving trophy tops in a whole new light. With dwindling square inches in my space, flipping these divers into removable tie and scarf hooks keep things organized and out in the open. 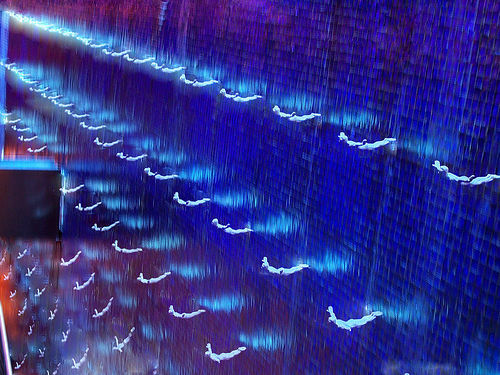 In the lobby of a favorite Mexican restaurant called Rosa Mexicano near New York City’s Lincoln Center, you’ll be greeted by a fountain wall of ceramic divers. I stored that design idea in the back of my mind until now. Spray paint the trophy heads a glossy white or in this case, a shiny turquoise. For some reason the color makes them look like sculpture. Cut a round piece of cardboard to finish off the open base of the trophy head. Glue the cardboard to the base and let dry. Glue a flathole keyhole picture hanger onto the trophy base. A simple flathead screw in the wall clicks into the picture hanger. Your new diver hooks hold scarves, ties, necklaces, and lightweight handbags with a sense of cool panache. 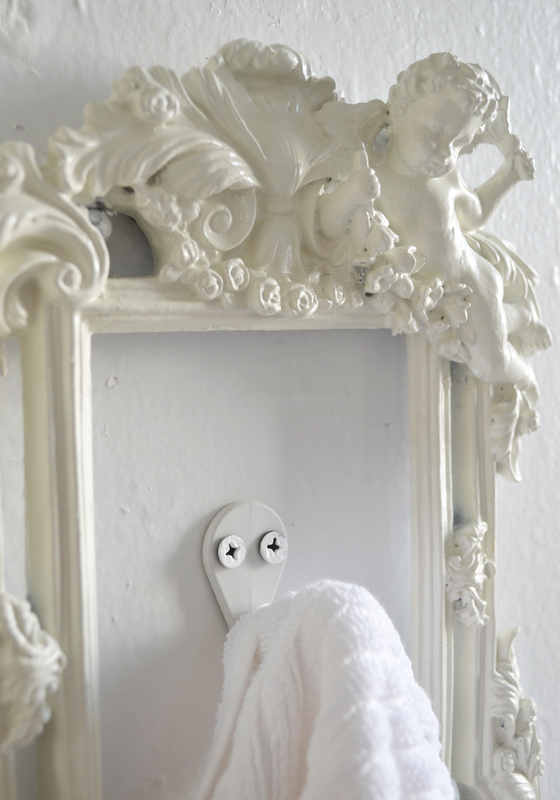 My friend installed a collection of these on a bathroom wall, painted in white to hold guest hand towels. Love it! 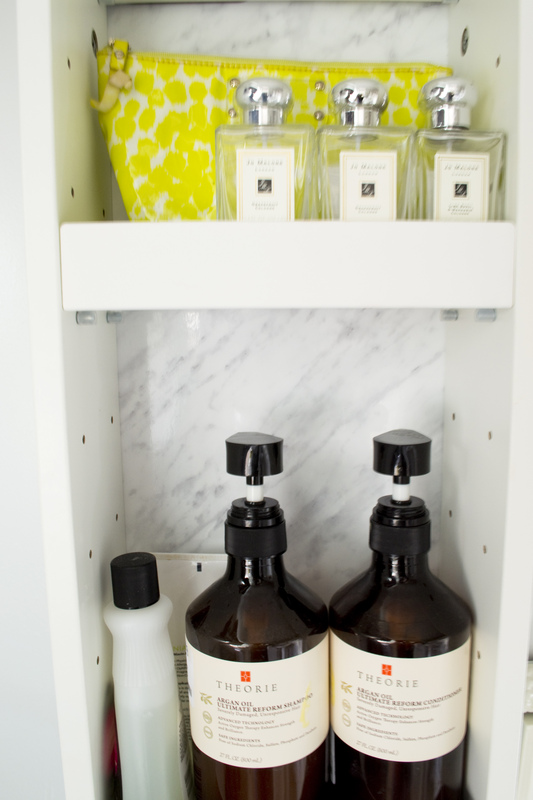 Keeping a small closet organized is no easy feat. The key to organizing success is to be able to see everything you have at a glance to get dressed quickly without a meltdown. In the past I stacked closed boxes and baskets on closet shelves, which looked neat and tidy from afar until I had to find something quickly. I needed an inexpensive organizing solution for my growing collection of clutch purses, wallets and sunglass holders. 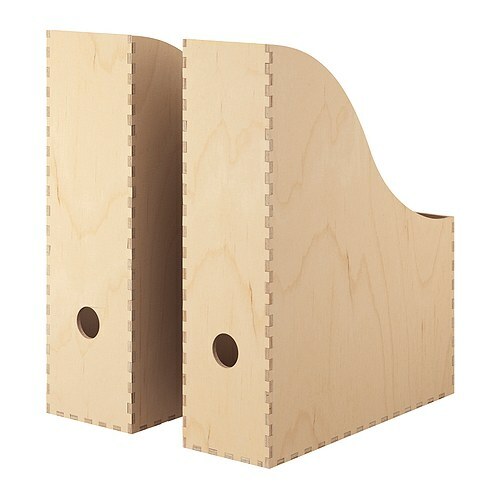 Wooden magazine and file holders from Ikea were the perfect solution. They keep my purses upright, easy to view and ready to grab on the go They take up very little space on a closet shelf, and you can organize by color. 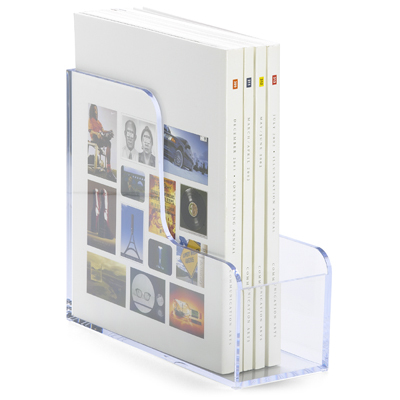 Clear acrylic magazine file holders from the Container Store are also a super chic way to organize your purses if the budget allows. 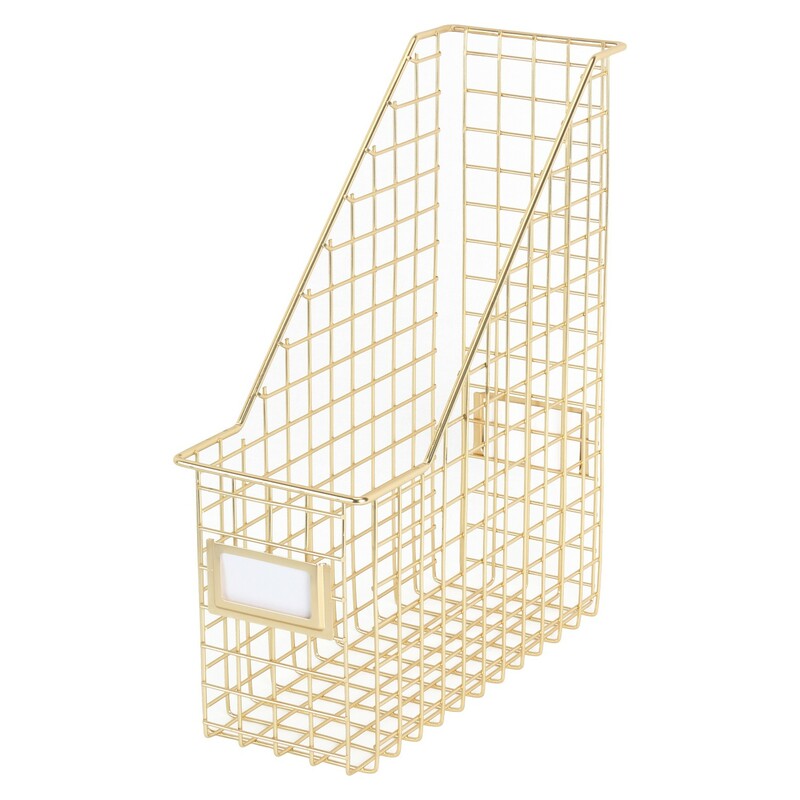 Gold metal magazine file holders from Target look fresh and can hold up under heavy use, unlike plain cardboard versions. 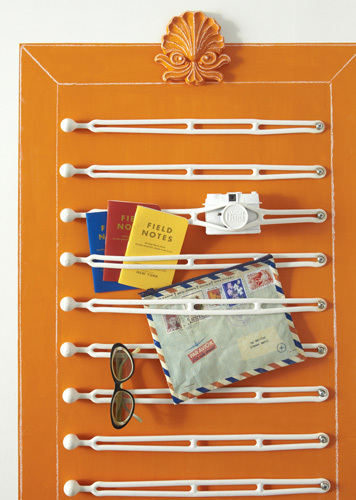 Paint the inside of the wooden magazine file holders a bright pop of color. A colorful backdrop makes it easier to pick out a particular purse in a crowd of purses, especially if they are all black. 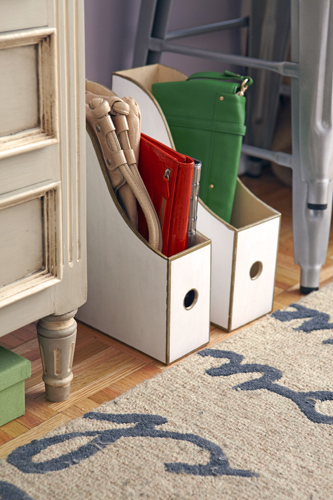 Whenever I discover a storage idea that is chic and on-the-cheap, I just have to share. 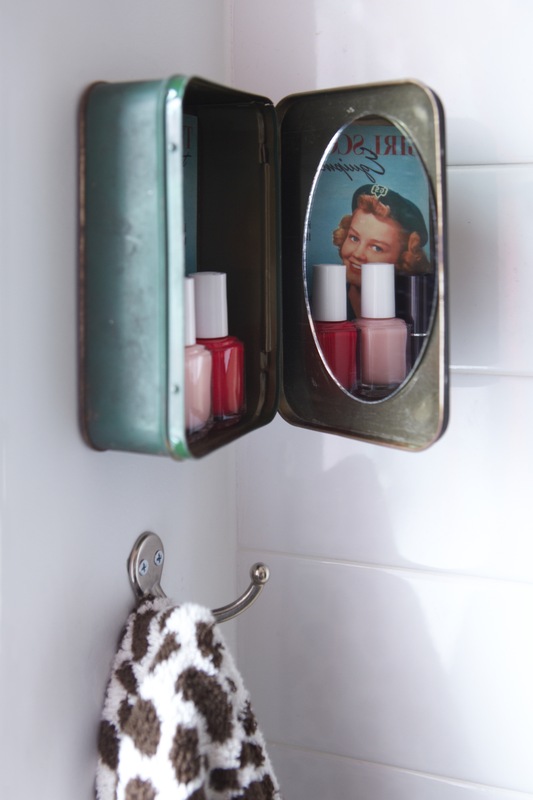 1950s and 40s vintage train and cosmetic cases are stylish enough to keep out in the open on a dresser or bathroom shelf. They also hide the bulkier beauty products, brushes and hair dryers undercover yet keeping everything accessible. Find them at flea markets, resale shops and etsy.com for under$40. 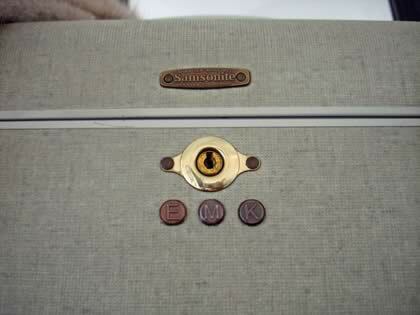 A vintage piece like this gives a small, ho-hum room a sense of history. 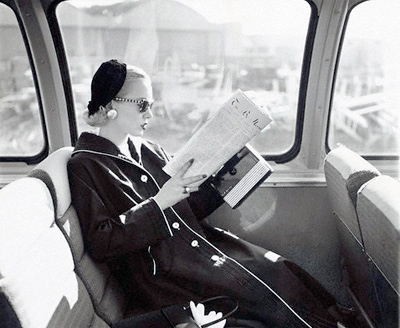 I imagine a young woman in the 50s, à la Grace Kelly, hopping on a train looking for romance and adventure in the big city, holding onto her train case with so much promise. 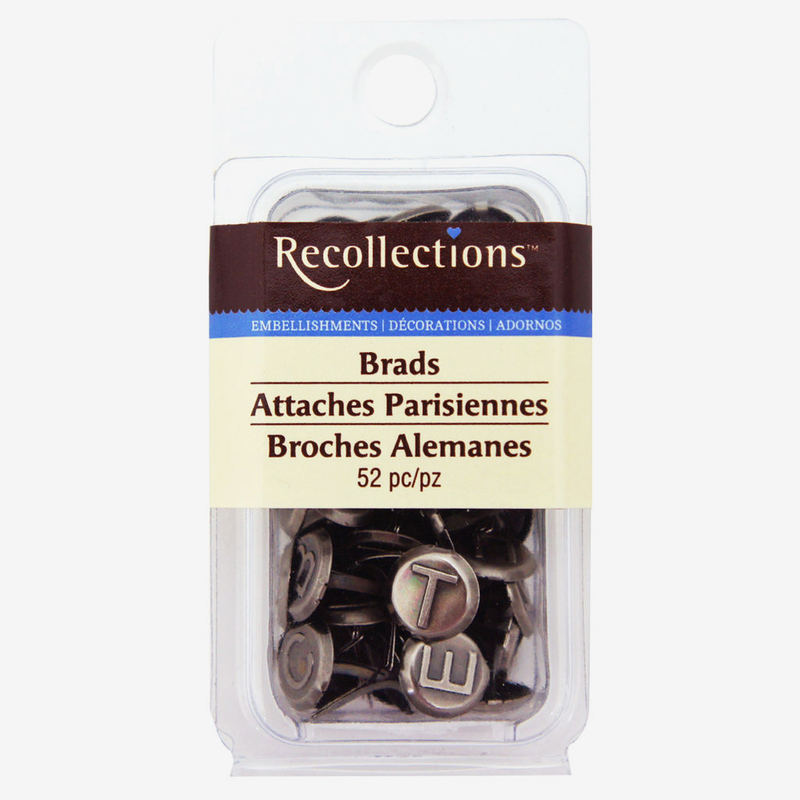 Give the train case a personal touch and attach inexpensive brass letter brads (you scrapbookers out there know how great brads are) for an instant monogram that costs less than $2.00. The case was too thick to poke the brads all the way through so I just glued them on. 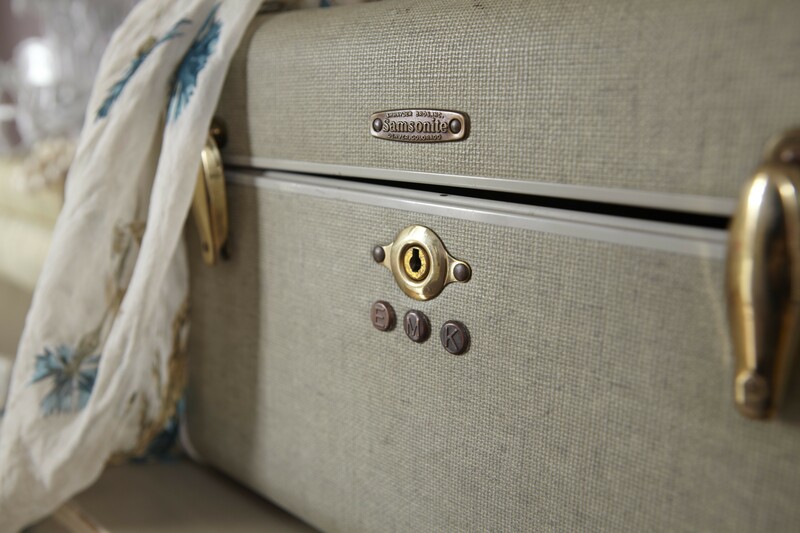 Make sure the used cases are clean from major stains inside, or think about re-lining the interior with your own fabric. 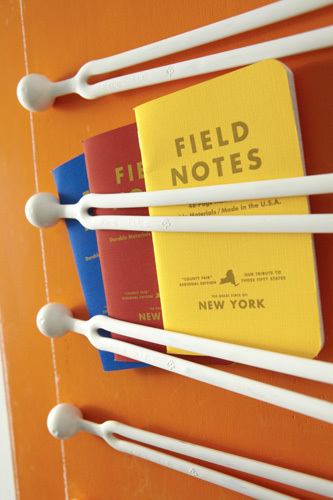 Check out clever ways to personalize your little nest here. Happy trails…and decorating, of course. Having an actual window in a NYC bathroom is a coup, but that opens up a privacy issue that I never had before. I tried curtains and a pull-down shade, but they blocked the precious sunlight that I get during the day. Being on a high floor, the bathroom window is usually cracked open and curtains got too dirty, too fast from the city dust. Driving in the city, I noticed pretty large decals clinging onto car windows. 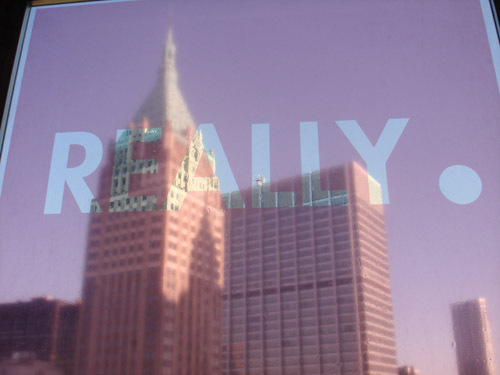 I put two and two together and found out that my local printing shop can print any image onto inexpensive static window cling. • Use a word document to write out your favorite phrase or saying. Choose a thicker, chunkier font that you love. This will show up as the clear or see-through part of the window cling design. • Choose a background color with your local printing shop. Select a hue that will provide privacy but is not too saturated to block out the light or change the way you look in the mirror. Shades of pink are flattering to the skin. • Give exact measurements of the window to the printers. They will play with the scale of the lettering to fit. My local printing shop did this for a very low, flat fee. • To attach window cling to the glass, use a spray bottle of water mixed with one drop of dishwashing soap. Spray the window. The bubbles allow the vinyl cling to glide and slide into place without leaving streaks. Position the cling at the top of the window. Unroll it slowly down the glass and use a squeegee to wipe the air bubbles away. • Wipe from the middle of the window out to the sides to remove the rest of the water. Once dry, the cling will stay put. 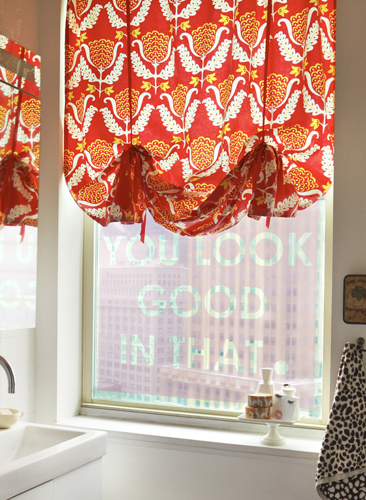 For more window camouflage projects, click here. For more project information, check out my new book, Living in a Nutshell. Scout’s honor! 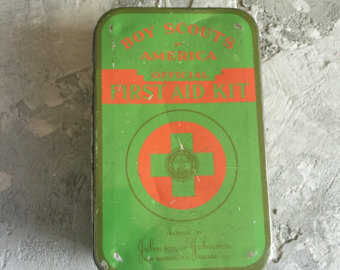 You’ll get a special badge for creativity if you use vintage Boy and Girl Scout first aid tins as whimsical bathroom storage. Raising daughters in a foreign land, my Korean mother never let us join the Girl Scouts. Something about pushing little girls to sell cookies door to door did not sit well with her. 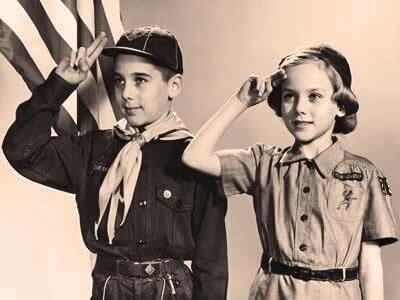 Regardless, my fascination with the badges, uniforms and first aid tins only grew as I got older. • I bought this tin, which dates around 1955, from eBay for about $12. You can also find them at etsy.com. The vintage Boy Scout Tins look kitschy cute too. 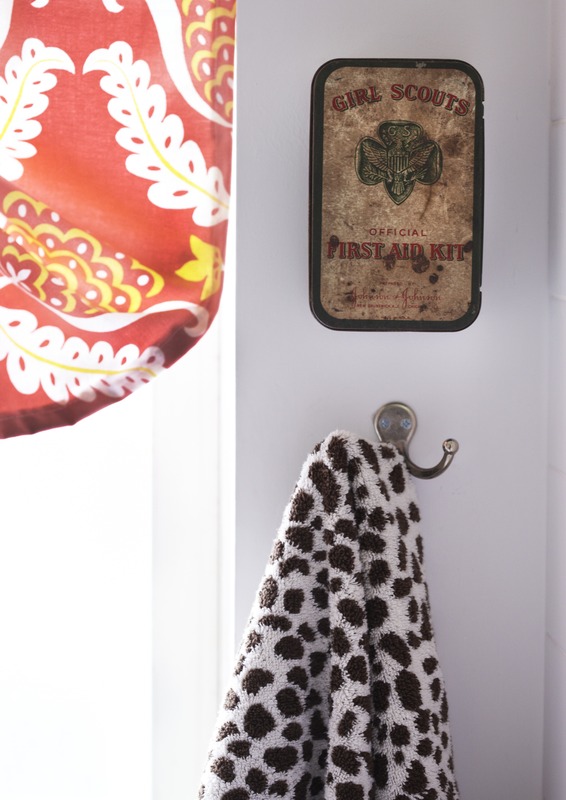 • Add Command Brand Removable Adhesive Strips on the back of the tin and affix to the bathroom wall. It is the perfect box to hide go-to nail polish and lipgloss. • Glue a small craft mirror inside the lid so you can do a last minute lipstick check before you leave for the day. For more unique ways to decorate with vintage objects, click here.